Do you love the look of freeform wirework? It’s what first drew me to making jewelry, and every so often I feel the need to get back to my roots. This time, though, I also want to teach you while I’m at it! Now freeform is what it implies — putting beads and wire wherever suits your look. However, if you’re used to a more structured type of jewelry, freeform wirework can be a little intimidating. Not to worry; I have loads of pictures with ideas of where you can place your wire and beads. I’ll also talk about the kinds of beads and wire used for the projects. Tools? It’s pretty simple — a wire cutter, a pair of round nose pliers and a pair of chain nose pliers. No fancy tools needed to get the fancy look! Creating a wire backbone for the pendant; I show you two different ways, so you can pick the one you like best. How to make neat wire wraps. How to work freeform, even if you’ve always used a pattern! The neat thing about this pendant is that once you learn the basics, you can make it as simple or fancy as you choose. You can also make them in many sizes — that’s the joy of freeform wirework. Not only do the colors of beads make a difference, but also the textures. Mixing matte with shiny, round with irregular, organic and synthetic — it’s all fair game! When you get right down to it, freeform is about taking supplies you might not ordinarily put togther and making something wondrous with it. I’ve got lots of photos for you in the ebook tutorial. In the 25 pages, you’ll find 43 full-color photos. There are a lot of close-ups, so you’ll be able to follow the steps easily, without squinting. 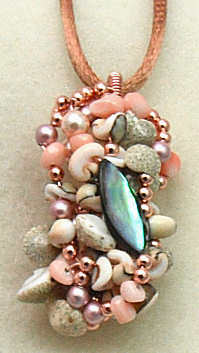 There are two projects in this freeform wirework beaded pendant tutorial; they are the pendants on this page. “Under the Sea” features pearls, shells and coral, for a subtle and elegant look. It’s really timeless and goes with just about anything. 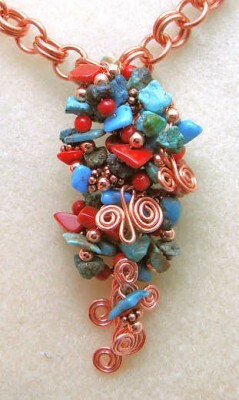 “Desert Spirit” is more Southwestern in flavor, featuring lots of turquoise and copper. It also has more movement, thanks to the dangles on the bottom, and the spirals in the body of the pendant. Here’s a quick overview of the pendants covered in the tutorial. Your tutorial is delivered as an ebook, so it’s an immediate download. This means you can satisfy your “need to bead” at any time of day or night! (Keep in mind that while you’re not getting a paperback copy in the mail, it also means that you don’t have to wait for the mailman — yay!) Also, because of the nature of this tutorial, there are no refunds. But I’ve tried my best to over-deliver for you! So click the “Add to Cart” button above and you’re on your way to making your very own freeform wirework beaded pendants. It’s secure and you can safely pay with any major credit card. You’ll receive the download link in an email lickety-split after you place your order. Thanks so much and I hope you enjoy making this piece of wire and beaded jewelry! is this something that I will need to do right away or else the chance is lost? I am in the middle of a lot of family responsibility right now. Not to worry, it’s not going anywhere soon. Take care your family responsibilities first, then come on back once you have a little “me” time for your beading.